The new and unique book MISSION MOON 3-D is hitting the shelves to warm the hearts of space buffs. 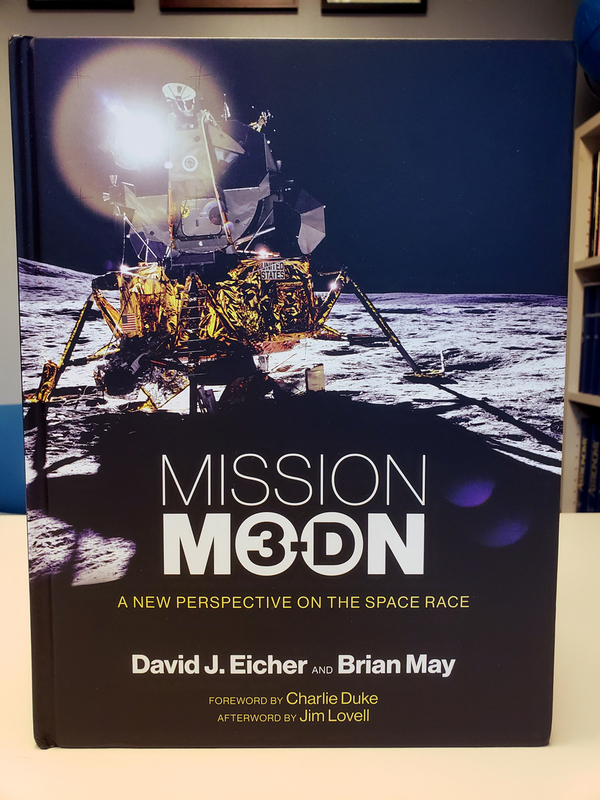 MISSION MOON 3-D by David J. Eicher and Brian May arrives; order now at https://myscienceshop.com/product/book/81192 !!! Foreword by Charle Duke; afterword by Jim Lovell. • 150 stereo photos of the Apollo missions and space race, the largest collection ever published — many never seen before in stereo. • Special 3-D viewer and introduction to stereoscopic photography by Brian May. • A comprehensive tale of the space race from both sides — U.S. and Soviet Union — by Astronomy Editor David J. Eicher. • New stories from the astronauts and cosmonauts whose shared perspective turned competing explorers into fast friends. 191 pp., more than 200 photographs, 40,000 words, hardcover, London Stereoscopic Co. and MIT Press, Cambridge, Mass., Oct. 30, 2018.